Kerinci has produced intermittent ash explosions in recent years, including December 2011, June 2013, March-June 2016, and November 2016 (BGVN 42:04). The Darwin Volcanic Ash Advisory Centre (VAAC) has issued the only reports on activity between December 2016 and July 2018, and these have been based on satellite data. The Indonesia volcano monitoring agency, Pusat Vulkanologi dan Mitigasi Bencana Geologi (PVMBG, also known as Indonesian Center for Volcanology and Geological Hazard Mitigation, CVGHM), has kept the Alert Level at 2 (on a scale of 1-4) since 9 September 2007. According to the Darwin VAAC, on 13 August 2017, an ash plume rose to an altitude of 4.3 km and drifted WSW. Sentinel-2 satellite imagery showed what appeared to be a small ash plume rising from the crater on 21 April 2018 (figure 4). The Darwin VAAC also reported that on 5 June 2018 a minor ash emission rose to an altitude of 4.3 km and drifted W (figure 5). On 10 June an ash plume rose to an altitude of 4 km and drifted W.
Figure 4. Natural color satellite image from Sentinel-2 on 21 April 2018 showing a small light-brown ash plume rising from the Kerinci summit crater. Courtesy of Sentinel Hub. Figure 5. 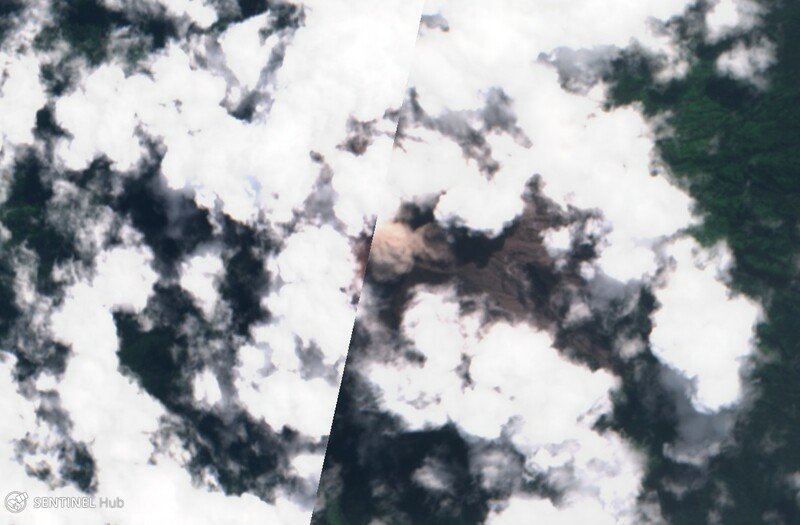 A brown ash plume is visible in this natural color Sentinel-2 satellite image of the Kerinci crater on 5 June 2018. Courtesy of Sentinel Hub. During the reporting period, no significant sulfur dioxide levels near the volcano were recorded by NASA's satellite-borne ozone instruments, and no thermal anomalies were detected. Information Contacts: Darwin Volcanic Ash Advisory Centre (VAAC), Bureau of Meteorology, Northern Territory Regional Office, PO Box 40050, Casuarina, NT 0811, Australia (URL: http://www.bom.gov.au/info/vaac/); Pusat Vulkanologi dan Mitigasi Bencana Geologi (PVMBG, also known as Indonesian Center for Volcanology and Geological Hazard Mitigation, CVGHM), Jalan Diponegoro 57, Bandung 40122, Indonesia (URL: http://www.vsi.esdm.go.id/); Sentinel Hub Playground (URL: https://www.sentinel-hub.com/explore/sentinel-playground); Hawai'i Institute of Geophysics and Planetology (HIGP) - MODVOLC Thermal Alerts System, School of Ocean and Earth Science and Technology (SOEST), Univ. of Hawai'i, 2525 Correa Road, Honolulu, HI 96822, USA (URL: http://modis.higp.hawaii.edu/); NASA Goddard Space Flight Center (NASA/GSFC), Global Sulfur Dioxide Monitoring Page, Atmospheric Chemistry and Dynamics Laboratory, 8800 Greenbelt Road, Goddard, Maryland, USA (URL: https://so2.gsfc.nasa.gov/). PVMBG reported that at 1051, 1456, and 1511 on 30 March brownish or grayish ash plumes from Kerinci rose 500-600 m above the crater rim and drifted NE. The Alert Level remained at 2 (on a scale of 1-4), and tourists were warned to remain outside of the 3-km exclusion zone. PVMBG reported that at 1309 on 13 February an observer noted a brownish-white ash plume rising 400 m above Kerinci’s crater rim and drifting NE. The Alert Level remained at 2 (on a scale of 1-4). Based on satellite images, ground observers, and wind model data, the Darwin VAAC reported that during 18-22 October ash plumes from Kerinci rose to an altitude of 4.3 km (14,000 ft) a.s.l. and drifted N, W, WSW, and SW.
Based on satellite data, the Darwin VAAC reported that on 22 July an ash plume from Kerinci rose to an altitude of 4.3 km (14,000 ft) a.s.l. and drifted SW.
Based on satellite data, the Darwin VAAC reported that on 10 June an ash plume from Kerinci rose to an altitude of 4 km (13,000 ft) a.s.l. and drifted W.
Based on satellite data, the Darwin VAAC reported that on 5 June a minor ash emission from Kerinci rose to an altitude of 4.3 km (14,000 ft) a.s.l. and drifted W.
Based on satellite data, the Darwin VAAC reported that on 13 August an ash plume from Kerinci rose to an altitude of 4.3 km (14,000 ft) a.s.l. and drifted WSW. Based on satellite data, the Darwin VAAC reported that on 15 November an ash plume from Kerinci rose to an altitude of 4.3 km (14,000 ft) a.s.l. and drifted 30 km NE. Based on satellite data and information from PVMBG, the Darwin VAAC reported that during 8-9 June ash plumes from Kerinci rose to an altitude of 4.3 km (14,000 ft) a.s.l. and drifted NW and N.
Based on satellite data and information from PVMBG, the Darwin VAAC reported that during 4-6 June ash plumes from Kerinci rose to altitudes of 4.3-4.6 km (14,000-15,000 ft) a.s.l. and drifted NW and N.
Based on a pilot observation, the Darwin VAAC reported that on 29 April an ash plume from Kerinci rose to an altitude of 6.1 km (20,000 ft) a.s.l. Based on reports from PVMBG, the Darwin VAAC reported that on 21 April an ash plume from Kerinci rose to an altitude of 4.3 km (14,000 ft) a.s.l., and drifted NE and E.
Based on reports from PVMBG, the Darwin VAAC stated that on 16 April ash plumes from Kerinci rose to an altitude of 4.6 km (15,000 ft) a.s.l. and drifted E.
PVMBG reported that during May-8 June 2015 white plumes from Kerinci rose 50-100 m and drifted E. Seismicity was dominated by signals indicating emissions (100-110 per day on average) as well as volcanic earthquakes (1 per day on average). The Alert Level remained at 2 (on a scale of 1-4). Residents and visitors were advised not to enter an area within 3 km of the summit. PVMBG reported that during 1 February-21 May 2015 white plumes from Kerinci rose 50-150 m and drifted E and W. Seismicity during 1-21 May was dominated by signals indicating emissions (100-110 per day on average) as well as volcanic earthquakes (1 per day on average). The Alert Level remained at 2 (on a scale of 1-4). Residents and visitors were advised not to enter an area within 3 km of the summit. 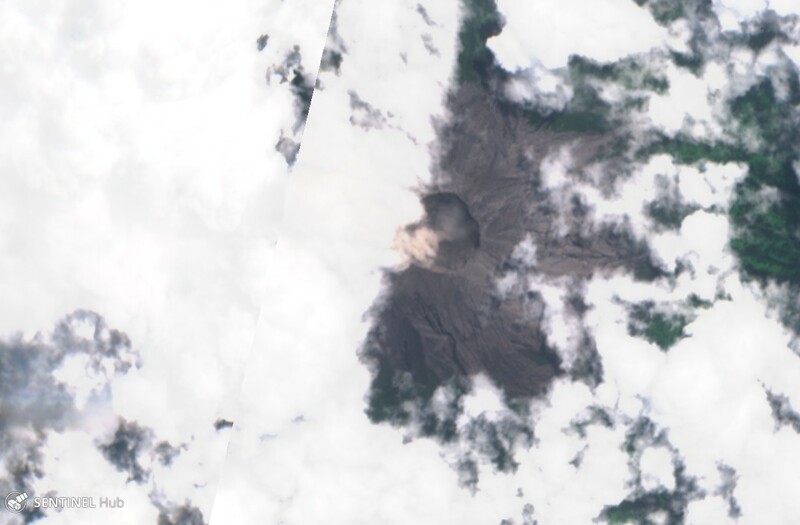 PVMBG reported that on 2 June 2013 an eruption at Kerinci from 0843 to 0848 generated an ash plume that rose 1 km above the crater. Ashfall as thick as 5 mm was reported in areas E, including Tangkil. During 1 February-13 April 2015 white plumes rose 50-150 m and drifted E and W. The Alert Level remained at 2 (on a scale of 1-4). Residents and visitors were advised not to enter an area within 3 km of the summit. CVGHM reported that diffuse white plumes from Kerinci typically rise about 300 m above the crater. On 9 September 2007 the Alert Level was raised to 2 (on a scale of 1-4) because "black smoke" plumes rose 800 m above the crater. The height of the plumes (described as "smoke") declined, but remained variable, so the Alert Level continued at 2. On 24 March 2008, ash-and-gas plumes rose to 4.3 km (14,100 ft) a.s.l. In early April 2009, increased seismicity was accompanied by ash plumes that rose as high as 600 m above the crater. During 1-20 April, light and dark plumes rose to a maximum of 500 m above the crater. On 19 April, ashfall was reported at a nearby observation post. 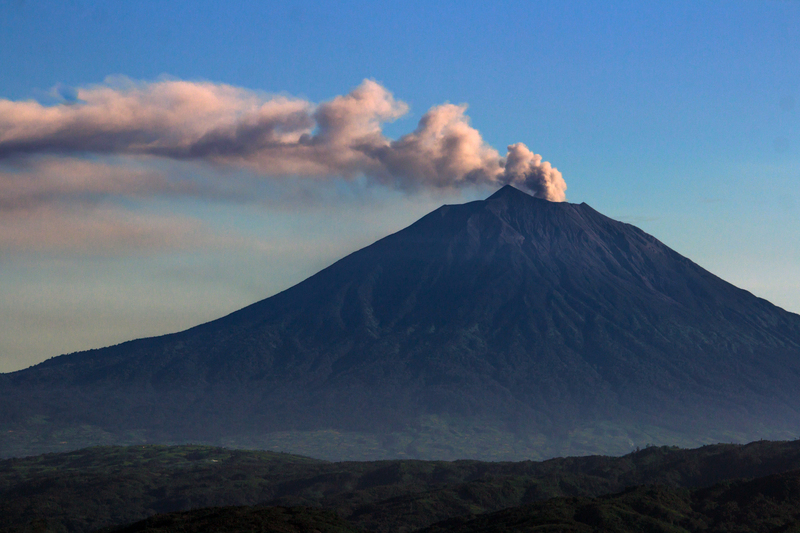 During 19-20 April, noises indicative of an eruption were heard at the observation post. The Alert Status remained at 2 (on a scale of 1-4). Residents and visitors were advised not to enter an area within 1 km of the summit. CVGHM reported that seismic and surface activity from Kerinci increased during 10-11 May. White plumes rose to altitudes of 4.3-4.5 km (14,100-14,800 ft) a.s.l. and drifted E. On 11 May, a gray plume was possibly spotted. The Alert Status remained at 2 (on a scale of 1-4). Residents and visitors were advised not to enter an area within 1 km of the summit. CVGHM reported that seismicity from Kerinci increased during 17-24 March. On 24 March, an ash-and-gas plume rose to an altitude of 4.3 (14,100 ft) a.s.l. The Alert Status remained at 2 (on a scale of 1-4). Residents and visitors were advised not to enter an area within 1 km of the summit. CVGHM reported that white plumes from Kerinci rose to altitudes of 4.1-4.3 km (13,500-14,100 ft) a.s.l. during 14-18 February. The Alert Status remained at 2 (on a scale of 1-4). Residents and visitors were advised not to enter an area within 1 km of the summit. CVGHM reported that the Alert Status of Kerinci was raised on 9 September from 1 to 2 (on a scale of 1-4). A pilot reported to the Darwin VAAC that an ash cloud emitted from Kerinci was visible on 27 September at 0813 drifting W at a height of ~6 km a.s.l. Ash was not visible on satellite imagery. Increased volcanic activity at Kerinci during late July led DVGHM to raise the Alert Level to 2 from 1 (on a scale of 1-4) on 6 August. During 24-31 July, volcanic and seismic activity increased at Kerinci. An ash plume rose 100-600 m above the crater rim and drifted W. Ash was deposited up to 1 cm thick and as far away as 3 km from the crater. There was an increase in volcanic earthquakes during the report week in comparison to the previous week. 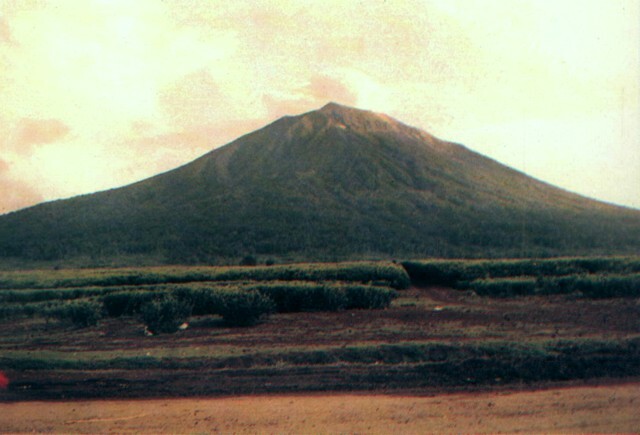 Visitors were advised not to climb to the volcano's peak until activity decreased. According to the Darwin VAAC, on 22 June an ash plume from Kerinci was observed drifting W at a height of ~3.8 km a.s.l. No ash was visible on satellite imagery. During 5-18 August, seismicity at Kerinci was dominated by small explosion earthquakes. According to the Darwin VAAC, on 27 August at 1000 an ash plume was observed at a height of ~3.5 km a.s.l. drifting to the NW. The cloud was not visible on satellite imagery. The Darwin VAAC reported that on 13 August around 0925 an ash plume from Kerinci rose to ~7.3 km a.s.l. Ash was not visible on satellite imagery. During 21-27 January, seismicity at Kerinci seemed to decrease in comparison to the previous week. Seismicity was dominated by 391 small explosions. Minor explosions on 26 January produced plumes 100-600 m above the summit. The volcano remained at Alert Level 2. Seismicity decreased during 30 December-6 January at Kerinci, with 341 small explosions occurring. In addition, plumes only reached 50-100 m above the summit in comparison to 100-800 m the previous week. The volcano remained at Alert Level 2 (on a scale of 1-4). Three explosions occurred at Kerinci during 19 and 25 December that produced predominately E-drifting plumes 100-800 m above the volcano. The volcano remained at Alert Level 2 (on a scale of 1-4). During 26 November- 2 December seismicity was dominated by 664 small explosion earthquakes. White, thick plumes rose 50-300 m above the volcano, which remained at Alert Level 2 (on a scale of 1-4). During 3-9 September activity at Kerinci was dominated by 1,128 small explosion earthquakes. On 9 September during 0800-1200 small explosions produced ash plumes that rose to 0.5 km above the volcano. Kerinci remained at Alert Level 2 (on a scale of 1-4). During 13-26 August eruptive activity ceased and seismic activity was dominated by small explosion earthquakes (2,252). The volcano remained at Alert Level 2 (on a scale of 1-4). On 9 August a small explosion at Kerinci produced an ash cloud that rose 700 m above the summit. Workers in rice fields around the volcano heard a booming sound and VSI personnel saw the dark brown ash cloud drift to the NNE. During 30 July-12 August seismographs recorded 990 small explosion events. The volcano was at Alert Level 2. Kerinci . . . was visited by a team of climbers 28-29 March. A white plume containing SO2 was continuously emitted from numerous fumaroles on the crater floor, 400 m below the summit. Information Contacts: T. Casadevall and A. Wight, USGS Bandung. Seismic signals during August through 20 September (1- 10 mm amplitude) arrived at ~5-minute intervals. This behavior preceded ash-bearing emissions up to 800 m above the summit, ~4x higher than those normally seen. By the end of September, both the seismic signals and emissions dropped, the latter reaching ~600 m high. Activity continued to decrease during October. White vapor was released from the crater and rose 800 m with occasional small explosions. During October seismic signals had a maximum amplitude of 7 mm. Activity increased beginning on 4 July. A gray-to-black plume escaped the summit crater under high pressure around noon. Local residents heard a noise similar to cannon-fire. The cloud rose 800-2,000 m above the summit. The eruption ended about 1700. On 5 July the volcano had resumed its normal level of activity; the plume reached heights of 100-400 m above the summit. Increasing activity culminated in an eruption on 3 November. In the early afternoon the volcano rumbled three times and ash covered the nearby village of Palempok. Residents also noticed a strong sulfur smell. Rumbling was heard twice on 6 November by residents of Tangkil and Palempok. Unfortunately, the seismograph used to monitor the volcano had been inoperative since 3 November. Information Contacts: R. Sukhyar, Volcanological Survey of Indonesia (VSI), Bandung, Indonesia (URL: http://www.vsi.esdm.go.id/). The intensity of eruption at Kerinci varied during April and May. White or gray ash plumes rose up to 700 m above the summit on many days during these months. Periodic increases and decreases in both volcanic and tectonic earthquakes were recorded. In June the number of daily volcanic earthquakes increased and the ash erupted from the summit became darker in color. During the week of 22-28 June, volcanologists noticed that the ash column rose 600 m above the summit under strong gas pressure and that the summit topography changed. On 28 June tremor became continuous and at 0630 on 29 June an ash column rose 1,000 m above the summit under strong gas pressure. Increased ash emissions and nearly continuous tremor continued for several weeks. Two eruptions of dark brown and black ash rose 800 m above the summit on 21 July. Black ash was vigorously ejected on 23 July. The ash from this eruption drifted eastward in a billowing cloud. Ash erupted on 28 July fell on nearby villages and farms. During August activity slowly decreased in intensity: tremor resumed normal levels and periods of duration, and emissions were a more normal dense white color. Eruption plumes rose to heights of 100-500 m. This calmer activity persisted through September. Persistent fumarolic activity occurred at Kerinci during February to mid-October 2000. During the report period Kerinci mainly produced light-colored, variably dense gas-and-steam plumes that rose 50-600 m. Plumes were occasionally reported to darken and become dense between 29 February and 20 March, possibly indicating ash emission, although no ashfall was reported. Small explosion earthquakes, usually related to gas discharge, dominated seismicity throughout the interval with an average of ~240 events recorded per week. These earthquakes were continuous during late April to mid-May. Consistent numbers of deep volcanic (A-type), shallow volcanic (B-type), and tectonic earthquakes occurred throughout the period. During the report interval no major eruptions were observed, and Kerinci's hazard status did not exceed 2 (on a scale of 1-4). During May 2001 through at least early January 2002, seismic activity at Kerinci was dominated by small explosion earthquakes. Plumes were visible above the summit and generally drifted E throughout most of the report period (table 1). Minor explosions occurred and on 9 August an explosion was accompanied by a booming sound heard by people working in rice fields around the volcano. At 0925 the same day a brown, high-pressure plume was observed reaching 700 m above the summit. The plume was visible drifting NNE for ~5 minutes. Table 1. Seismicity at Kerinci during 7 May 2001 through 6 January 2002. The left-hand column shows time intervals; the adjacent four columns indicate the number of earthquakes or maximum tremor amplitudes seen during the time intervals; the right-hand column adds comments about plume heights. Courtesy VSI. Eruptive activity stopped briefly during mid-August. During 0800-1200 on 9 September, explosive activity produced a brown ash plume that rose 500 m above the summit. Gas pressure was low in early November and seismic activity decreased slightly. The volcano remained at Alert Level 2 (on a scale of 1-4) throughout the report period. During January-May 2002, seismic activity at Kerinci was dominated by small explosion earthquakes. Plumes reached up to 600 m above the summit (table 2). An explosion during 0950-1030 on 4 May produced ash that rose 400 m above the summit. The Alert Level remained at 2 throughout the report period. Table 2. Seismicity and plume observations at Kerinci during 7 January through 19 May 2002. Courtesy VSI. 07 Jan-13 Jan 2002 4 3 263 3 White thin-thick medium-pressure plume rose 50-100 m and drifted E.
21 Jan-27 Jan 2002 4 -- 391 13 A minor explosion on 26 January produced a dark gray plume that rose ~100-600 m above the summit. 28 Jan-03 Feb 2002 1 -- 630 9 Gray plume reached 500 m above the summit. 04 Feb-10 Feb 2002 -- 4 461 10 A minor explosion on 8 February produced a thick gray ash plume that rose 500 m above the summit. 11 Feb-17 Feb 2002 1 -- 172 2 White thick plume rose 50-300 m.
18 Feb-24 Feb 2002 1 -- 133 6 White thick plume 50-300 m above the summit. 25 Feb-03 Mar 2002 -- 1 628 4 White thick plume 50-300 m above the summit. 03 Mar-10 Mar 2002 -- -- 673 -- White thick medium-pressure plume 50-400 m above the summit. 11 Mar-17 Mar 2002 -- -- continuous 6 White thick medium-pressure plume 50-500 m above the summit. 18 Mar-24 Mar 2002 1 3 continuous 5 White brown thick plume ~100-500 m above the summit; drifted E.
25 Mar-31 Mar 2002 -- 1 continuous 8 White brown thick medium-high pressure plume 100-500 m above the summit; drifted E.
01 Apr-07 Apr 2002 4 2 294 6 White-brownish medium-high pressure plume 100-500 m above the summit; drifted E.
08 Apr-14 Apr 2002 1 1 262 4 White thick darkish medium-high pressure plume 50-300 m above the summit; drifted E.
15 Apr-21 Apr 2002 1 -- 272 7 White thick medium-high pressure plume rose 50-500 m above the summit; drifted E.
22 Apr-28 Apr 2002 1 0 352 8 White thin-thick medium-high pressure plume rose 50-400 m above the summit. 29 Apr-05 May 2002 3 0 continuous 6 White-brownish ash plume rose 400 m above the summit. During 27 May-8 September 2002, seismicity at Kerinci was dominated by continuous small explosion earthquakes. Plumes reached up to 800 m above the summit (table 3). The Alert Level remained at 2 throughout the report period. Table 3. Earthquakes reported at Kerinci during 27 May-8 September 2002. Continuous small explosions were reported throughout the report period. Courtesy VSI. 27 May-02 Jun 2002 -- -- -- Low-pressure plume reached 600 m and drifted W.
03 Jun-09 Jun 2002 1 2 2 Whitish-gray, thick, low-pressure plume reached 700 m and drifted W.
10 Jun-16 Jun 2002 3 1 10 Whitish-gray, thick, medium-pressure plume rose 700-800 m.
17 Jun-23 Jun 2002 1 8 16 Whitish-gray, thick, medium-pressure plume rose 100-500 m and drifted W.
24 Jun-30 Jun 2002 7 1 7 Whitish-gray, thick, medium-pressure plume rose 100-500 m and drifted W.
01 Jul-07 Jul 2002 3 1 3 White ash plume rose 50-500 m and drifted W.
08 Jul-14 Jul 2002 1 2 3 Whitish-gray ash plume rose 100-500 m and drifted E.
15 Jul-21 Jul 2002 2 2 0 Whitish-gray ash plume rose 100-400 m and drifted E.
22 Jul-28 Jul 2002 3 1 3 Whitish-gray ash plume rose 100-400 m and drifted E.
29 Jul-04 Aug 2002 0 0 4 White thin-thick ash plume rose 100-300 m and drifted W.
05 Aug-11 Aug 2002 8 0 5 White thin-thick ash plume rose 100-300 m and drifted W.
12 Aug-18 Aug 2002 2 3 5 White thin-thick ash plume rose 100-300 m and drifted E.
19 Aug-25 Aug 2002 2 1 5 White, thin, medium-pressure ash plume rose 100-400 m and drifted E.
26 Aug-01 Sep 2002 3 0 2 Whitish-gray, thin, medium-pressure ash plume rose 100-500 m and drifted S.
02 Sep-08 Sep 2002 0 3 7 White, thin-medium, medium-pressure ash plume rose 100-300 m and drifted S.
Emissions were continuous through at least late October 2002 (table 4). During most of the period 9 September-27 October a "white-thin ash plume" rose 50-400 m and drifted toward the W or SW. No ashfall was reported. Kerinci remained at Alert Level 2 (on a scale of 1-4). No further reports were issued during 2002. Table 4. Earthquakes registered at Kerinci during 9 September-27 October 2002. Courtesy VSI. Although frequently active, the most recent eruptive period at Kerinci had ended by late 2002 (BGVN 27:08 and 27:12). A new eruptive episode was reported by the Directorate of Volcanology and Geological Hazard Mitigation (DVGHM) starting in late July. However, the Darwin Volcanic Ash Advisory Centre (VAAC) issued an advisory on 22 June after receiving a report of ash from Kerinci at ~ 3.8 km altitude (summit level) drifting W; no ash was visible on satellite imagery. During 24-31 July 2004 observers reported seeing a "white, thick blackish" plume rising 100-600 m above the crater rim and drifting WSW. Ashfall deposits as thick as 1 cm were identified at distances of 3 km from the summit. The number of volcanic earthquakes recorded rose during this week and remained high through the week ending on 8 August (table 5). Another eruption on the morning of 6 August sent a gray ash plume 600 m above the summit. Based on the increased activity, DVGHM raised the hazard status to Alert Level II (yellow). Table 5. Seismicity at Kerinci, 12 July-29 August 2004. Courtesy of DVGHM. Volcanic earthquakes decreased during 9-15 August, although continuous emission signals were still being recorded and thin white plumes were seen rising 50-300 m above the summit. Similar activity continued the following week. A thick gray plume rising 50 m was reported the week of 23-29 August, but there was no change in seismicity. Information Contacts: Dali Ahmad, Hetty Triastuty, Nia Haerani, and Sri Kisyati, Directorate of Volcanology and Geological Hazard Mitigation, Jalan Diponegoro No. 57, Bandung 40122, Indonesia, URL: http://www.vsi.esdm.go.id/); Darwin Volcanic Ash Advisory Centre (VAAC), Bureau of Meteorology, Northern Territory Regional Office, PO Box 40050, Casuarina, NT 0811, Australia (URL: http://www.bom.gov.au/info/vaac/). Events at Kerinci were previously discussed through 29 August 2004 (BGVN 29:08). The following report overlaps slightly, covering 17 July through 24 October 2004. As already reported, on 24 July 2004 a thick plume rose to 100-600 m above the crater rim, ash fell ~ 3 km from the crater forming deposits as thick as 1 cm. Seismicity is summarized in table 6. Table 6. Volcanic seismicity registered at Kerinci during 17 July to 24 October 2004. Courtesy of DVGHM. There were six Darwin VAAC reports on Kerinci in 2004, two on 21 June and four on 27 September. (Prior to that the VAAC reports were clustered in mid- to late-August 2002.) The 21 June cases discussed a continuous emission with ash to ~ 4 km drifting W. The 27 September cases began with and then repeated an aviator's statement (an AIREP at 0136 UTC 27 September), noting that ash was observed to ~ 6 km, drifting W. For all six cases (June and September), the VAAC staff noted that due to cloud cover, ash was not visible in satellite data. 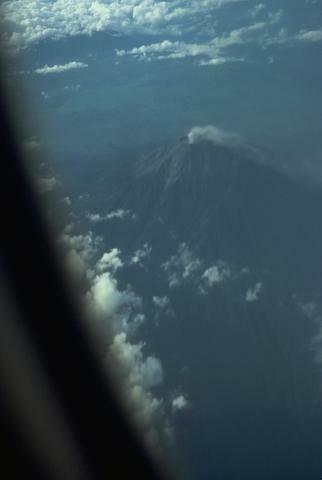 Kerinci erupted on 6 August 2004 at 0835 hours. Gray ash rose to 50-600 m above the summit. The hazard status was raised to Alert Level II (yellow) at 1030, where it stayed for the remainder of this report period. During 9-15 August 2004 the number of earthquakes decreased. A white thin plume again rose to 50-300 m above the summit. Volcanic activity remained relatively stable from 15 August through 24 October 2004, with thick gray plumes rising 50-300 m above the summit. Kerinci last erupted on 6 August 2004. Following that, the volcano was relatively quiet through January 2005 (BGVN 30:01). This report discusses events through 11 May 2008. Satellite thermal imaging has not shown any "hot-spots" for the past several years, but the behavior there has been characterized by emissions of billows of thin white smoke that rose to ~ 200 m above the crater. On 8 September 2007, a number of minor seismic events occurred. On 9 September, vapor emissions increased, pulsing at ~ 5-minute intervals, and accompanied by inky black ash. The plume rose ~ 700-800 m above the crater rim and ash fell within ~ 8 km of the vent. The Center of Volcanology and Geological Hazard Mitigation (CVGHM) reported that the Alert Status was raised to 2 (on a scale of 1-4). 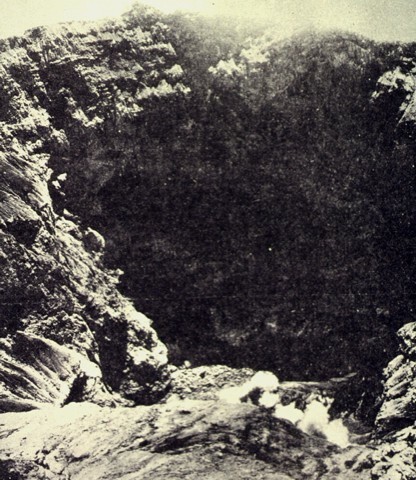 Visitors and tourists were not permitted to approach the crater closer than 1 km. Activity in the following months did not show any significantly abnormal behavior until 14-18 February 2008, when more voluminous thick white plumes rose ~ 500 m above the crater rim. According to CVGHM, the seismicity increased during 17-24 March 2008. On 24 March, an ash-and-gas plume rose to an altitude of 4.3 km. Another increase in seismicity occurred during 10-11 May, when thick white plumes rose to altitudes of 4.3-4.5 km and drifted E. The Alert Status remained at 2. Information Contacts: Center of Volcanology and Geological Hazard Mitigation (CVGHM), Jalan Diponegoro 57, Bandung 40122, Indonesia (URL: http://www.vsi.esdm.go.id/); Hawai'i Institute of Geophysics and Planetology (HIGP) Thermal Alerts System, School of Ocean and Earth Science and Technology (SOEST), Univ. of Hawai'i, 2525 Correa Road, Honolulu, HI 96822, USA (URL: http://modis.higp.hawaii.edu/). Since a 2004 eruption, Kerinci had been relatively quiet except for ash plumes in September 2007 and ash and steam plumes in February, March, and May 2008 (BGVN 33:05). Eruptions sent ash plumes hundreds of meters above the crater during the first three weeks of April 2009, causing ashfall 8 km away. A report on this period by the Center of Volcanology and Geological Hazard Mitigation (CVGHM) noted that the active crater normally emits whitish plumes ~300 m above the peak. During September 2007 through at least 21 April 2009 the Alert Level remained at 2 (on a scale of 1-4). Residents and visitors have been advised to remain at least 1 km from the summit and to don masks in cases of heavy ashfall. According to CVGHM, seismicity also increased at Kerinci during the first three weeks of April 2009. The signals were generally dominated by those from eruptions and their associated seismically detected signals traveling through air (as opposed to rock), 'air blasts.' The daily average of air blasts was 38, with the daily maximum reaching 54. The amplitudes of eruptive earthquake signals were 5-49 mm; the amplitudes of the air blasts were 0.5-9 mm. In addition, earthquakes during this 3-week period also included those of deep volcanic origin on 9 and 10 April (1 per day). The increased seismicity was accompanied by steam-, ash-, or cinder-bearing plumes, sometimes dense, that rose as high as 500-600 m above the crater. On 3 April an eruption reached ~500 m above the crater; variable plumes continued through 12 April. A nearby observation post reported the rumbling of eruptions and ashfall during 19-20 April that extended as much as 8 km from the crater. The eruptions deposited loose material (ash, cinders, lapilli, volcanic bombs, etc.) along the volcano's slope that leads to a nearby river. CVGHM was concerned that a heavy rain in the vicinity of the volcano could pick up this loose material and cause a lahar along the river channel. Satellite thermal monitoring using MODVOLC during 2009 recorded over 25 alerts at Kerinci between 29 April and 19 June 2009. Information Contacts: Center of Volcanology and Geological Hazard Mitigation (CVGHM), Jalan Diponegoro 57, Bandung 40122, Indonesia (URL: http://www.vsi.esdm.go.id/); MODVOLC, Hawai'i Institute of Geophysics and Planetology (HIGP) Thermal Alerts System, School of Ocean and Earth Science and Technology (SOEST), Univ. of Hawai'i, 2525 Correa Road, Honolulu, HI 96822, USA (URL: http://modis.higp.hawaii.edu/). After an eruption in April 2009 (BGVN 34:12), Kerinci was quiet until it erupted again in December 2011. The Indonesian agency responsible for volcano monitoring is the Pusat Vulkanologi dan Mitigasi Bencana Geologi (PVMBG), also known as the Center for Volcanology and Geological Hazard Mitigation (CVGHM). Since mid-December 2011 there have been four instances where there was an emission of ash, qualifying the event as an eruption. These took place in December 2011, June 2013, and twice in 2016. The eruptions in 2016 were separated by five months, so are treated as distinct eruptions. PVMBG mentioned in its 2015 reports on Kerinci that an eruption on 15 December 2011 generated an ash plume that rose about 600 m above the summit (summit elevation is 3.8 km). No other details were given. A brief eruption was reported by PVMBG on 2 June 2013, from 0843 to 0848, that generated an ash plume 1 km above the crater. Ashfall as thick as 5 mm was reported in areas to the E, including Tangkil (7.5 km SE). In a Jakarta Post story, a resident of Sungai Rumpun village (about 10 km SE) reported hearing a loud bang and black plumes with a sulfur odor. The article noted that several villages in Gunung Tujuh district (an area that includes the SE flank of the volcano) received heavy ashfall, but it was washed off the crops by rain. Although PVMBG reported white plumes during 1 February-12 July 2015 that rose 50-300 m and drifted E and W, no clear eruptive activity was noted. Seismicity during this period was dominated by signals indicating emissions and shallow volcanic earthquakes. Climbers who reached the summit around this time (exact dates not reported, images uploaded 17 January 2016) photographed steam plumes (figure 1) and solid lava flows (figure 2) in the crater. Figure 1. Photo of a steam plume rising from the Kerinci summit crater. Date not reported; uploaded 17 January 2016. Courtesy of Bernhard Huber (https://www.flickr.com/photos/97278656@N08/24156018990/in/album-72157663604254016/, CC BY-NC-ND 2.0). Figure 2. 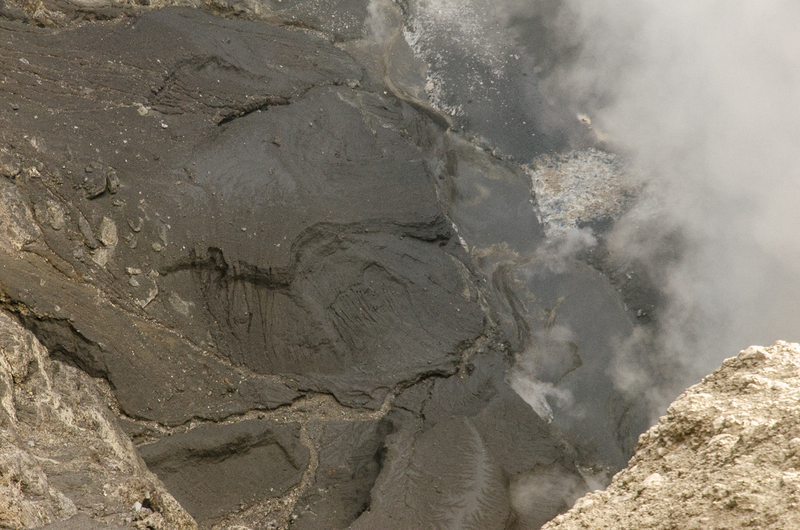 Photo of the crater floor at Kerinci showing solidified lava flows and steam. Date not reported; uploaded 17 January 2016. Courtesy of Bernhard Huber (https://www.flickr.com/photos/97278656@N08/24083967639/in/album-72157663604254016/, CC BY-NC-ND 2.0). Based on satellite images and ground reports from PVMBG, the Darwin Volcanic Ash Advisory Centre (VAAC) reported that during 15 days between 31 March and 9 June 2016 ash plumes rose to altitudes of 4.0-4.9 km and drifted N, NW, NE, E, and WSW. On 29 April an ash plume rose to an altitude of 6.1 km. Figure 3. Photo of Kerinci showing a plume rising from the summit crater on 9 June 2016. Courtesy of Luke Mackin (https://www.flickr.com/photos/wildsumatra/28318449485/, CC BY-NC-SA 2.0). Ash plumes were again reported on 15-19, and 21 November 2016 based on observations of satellite data by the Darwin VAAC. The plumes rose to altitudes of 4.3-4.6 km and drifted NE, ENE, SE, and S. On 15 and 17 November they drifted almost 30 km downwind. The Alert Level remained at 2 (on a scale of 1-4), where it has been since September 2007, and PVMBG advised residents and visitors not to enter an area within 3 km of the summit. Information Contacts: Pusat Vulkanologi dan Mitigasi Bencana Geologi (PVMBG, also known as Indonesian Center for Volcanology and Geological Hazard Mitigation, CVGHM), Jalan Diponegoro 57, Bandung 40122, Indonesia (URL: http://www.vsi.esdm.go.id/); Darwin Volcanic Ash Advisory Centre (VAAC), Bureau of Meteorology, Northern Territory Regional Office, PO Box 40050, Casuarina, NT 0811, Australia (URL: http://www.bom.gov.au/info/vaac/); Bernhard Huber (URL: https://www.flickr.com/photos/97278656@N08/, https://creativecommons.org/licenses/by-nc-nd/2.0/); Luke Mackin (URL: https://www.flickr.com/photos/wildsumatra/, https://creativecommons.org/licenses/by-nc-sa/2.0/); Jakarta Post (URL: http://www.thejakartapost.com/news/2013/06/02/mt-kerinci-erupts.html). Gunung Kerinci in central Sumatra forms Indonesia's highest volcano and is one of the most active in Sumatra. It is capped by an unvegetated young summit cone that was constructed NE of an older crater remnant. There is a deep 600-m-wide summit crater often partially filled by a small crater lake that lies on the NE crater floor, opposite the SW-rim summit. The massive 13 x 25 km wide volcano towers 2400-3300 m above surrounding plains and is elongated in a N-S direction. Frequently active, Kerinci has been the source of numerous moderate explosive eruptions since its first recorded eruption in 1838. This volcano is located within the Tropical Rainforest Heritage of Sumatra, a UNESCO World Heritage property. Remarks: Shallow-sourced inflation at Kerinci preceded the April 2009 eruptions. There is no Emissions History data available for Kerinci. Kerinci, Indonesia's highest volcano, rises to 3800 m above tea plantations on the south. A steam plume rises from the summit, which consists of an unvegetated cone containing a 600-m-wide, steep-walled summit crater over 400 m deep with a crater lake at the bottom. Frequent small-to-moderate explosive eruptions have occurred in historical time from Kerinci, one of Sumatra's most active volcanoes. A commerical flight above the Padang Highlands of central Sumatra provides a view of a steam plume rising from the summit crater of Kerinci, Indonesia's highest volcano. Conical Kerinci volcano towers above tea plantations below its southern flank. 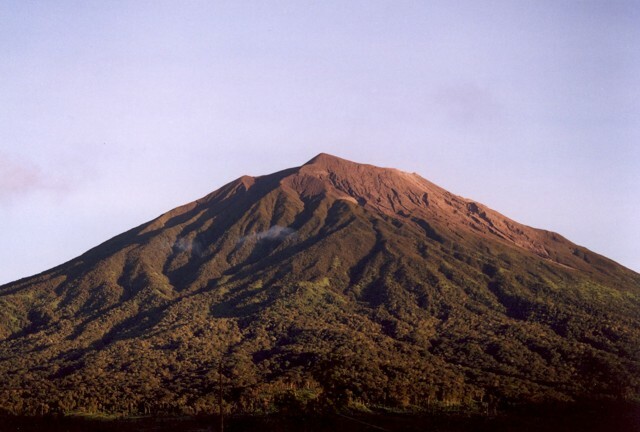 The 3800-m-high Gunung Kerinci is the most prominent feature of the massive Kerinci-Seblat Reserve. The Reserve stretches along a 345 km section of the mountainous spine of Sumatra and is the home of most of the larger Sumatran mammals, including rhinos, tigers, tapirs, elephants, clouded leopards, and sun bears. 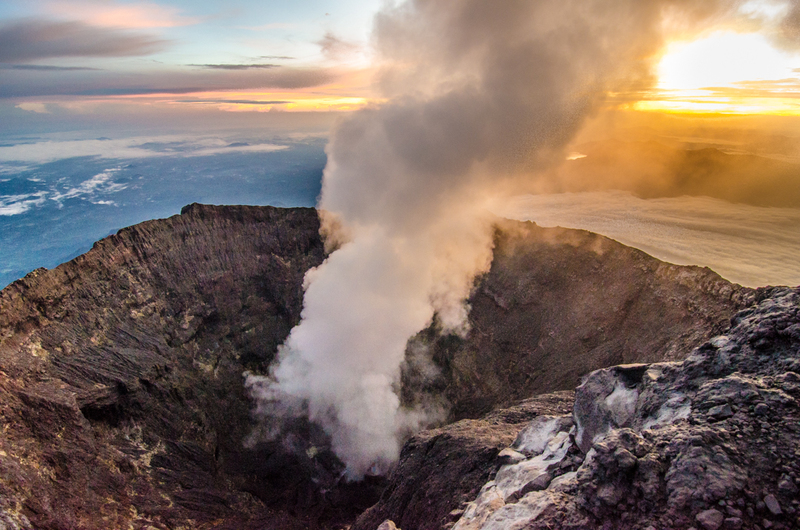 A steam plume commonly rises from the summit crater of Kerinci, one of the most active volcanoes in Sumatra. Photo by D. Rochendi, 1984 (Volcanological Survey of Indonesia). The steep-walled, 600-m-wide summit crater of Kerinci volcano is seen from its southern rim. The crater, which caps Indonesia's highest volcano, is 450 m deep and is often contains a small lake. Photo by S. Wikartadipura, 1972 (published in Kusumadinata, 1979, "Data Dasar Gunungapi Indonesia"). The unvegetated summit of 3800-m-high Gunung Kerinci in central Sumatra, Indonesia's highest volcano, is seen from Pengamatan on its southern flank. 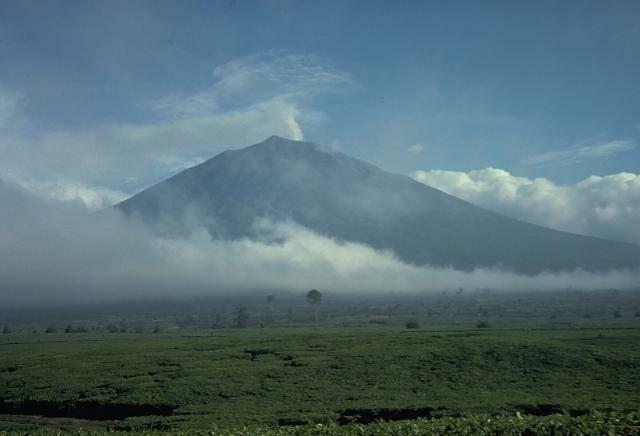 Kerinci is one of the most active volcanoes in Sumatra and has been the source of numerous moderate explosive eruptions since its first recorded eruption in 1838. The massive 13 x 25 km wide volcano towers 2400-3300 m above surrounding plains and is elongated in a N-S direction. Photo by Umar Rosadi, 2005 (Centre of Volcanology & Geological Hazard Mitigation, Volcanological Survey of Indonesia). There are no samples for Kerinci in the Smithsonian's NMNH Department of Mineral Sciences Rock and Ore collection. Large Eruptions of Kerinci Information about large Quaternary eruptions (VEI >= 4) is cataloged in the Large Magnitude Explosive Volcanic Eruptions (LaMEVE) database of the Volcano Global Risk Identification and Analysis Project (VOGRIPA).